Question: Does Carrey favor any charities or stuff like that? Does he do benefits? Answer: Yeah, I know of at least a couple that he has supported for years. He has done stuff for 'Comic Relief', which is a charity that aids homeless people. (This is not a surprise, see biography) Carrey did that show in '92, and appeared on some of the 'Comic Relief' specialty videos that came out. Carrey was Honorary Chairman for the National Veterans Foundation (NVF) A-PAC-A-LAFS-NOW (Apocalypse Now) comedy event in June of '95, held at The Comedy Store in Los Angeles. He had appeared at six of the seven previous engagements, but his filming schedule on "Ace Ventura: When Nature Calls" kept him out of the event this year. Carrey said of the event, "The foundation (NVF) has gained a lot of support from the comedy world. Many of us have tremendous respect for the work that is carried out by NVF on a daily basis. Using comedy to heal and help those less fortunate is a great thing." 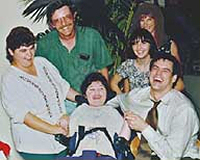 Carrey's ex-wife Melissa was the Event Chair of 1995's charity event. For more info about this cause call NVF at 1-800-366-8823. The Hollywood Premiere of "The Cable Guy" was a benefit for Comic Relief. The event, held at Mann's Chinese Theater raised money for the charity that helps out the homeless. Various and sundry personalities assosciated with the Charity attended the event and it was a success. In 2005 he established the Better U Foundation with the goal of promoting transformational and sustainable ideas that can improve the lives of people around the world. More information about his charity work can be found here.